It’s ready, after months of hard work: the ‘Up & Close’ babywearing app! After seeing the same questions being asked on Facebook over and over again, I thought it was time for an app! 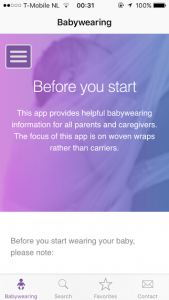 The ‘Up & Close’ app offers a lot of information on babywearing, the do’s and don’ts, wrap sizes, etcetera. It also contains an extensive search engine with over 70 carries for front, hip and back carrying. You can easily find video tutorials for each carry and keep preferred carries in your personal list of favorites. I hope you enjoy it! Your feedback is very welcome (contact@upandclose.nl). Search for information by entering the name of a specific carry. Search for all available carries that can be done with a wrap of a specific size. Position: front, hip or back carries. Find carries that are suitable for children that straighten their legs a lot. Find carries that are suitable for children that lean back often. Will the carry involve multiple layers of wrap over my child? The number of shoulders involved? All search results contain a link to video tutorials on YouTube. Carries that appear in a search result can be marked as ‘favorite’. These carries appear in your personal list of favorites. The list offers you an easy way to find the information about these carries and the link to video tutorials at a later moment . Contact information and general information about Up & Close, about me, the purpose of the app and some disclaimers.